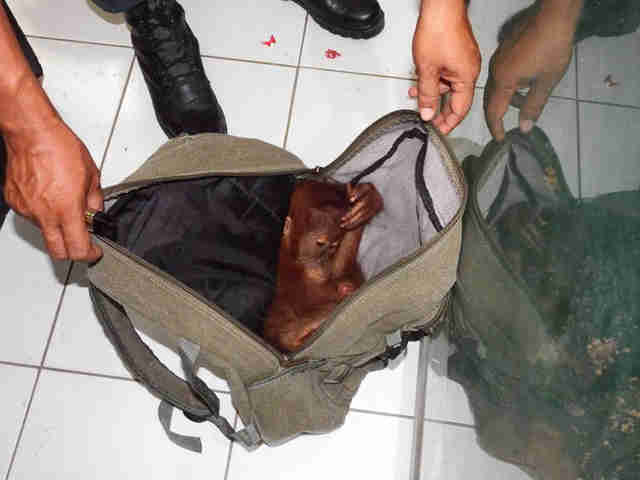 A baby orangutan found stuffed inside a backpack was confiscated just in time to avoid a grim fate - and the person responsible is being brought to justice. Clinging to life, the young ape, under a year old, narrowly avoided being sold into the exotic pet trade when he was rescued in February. 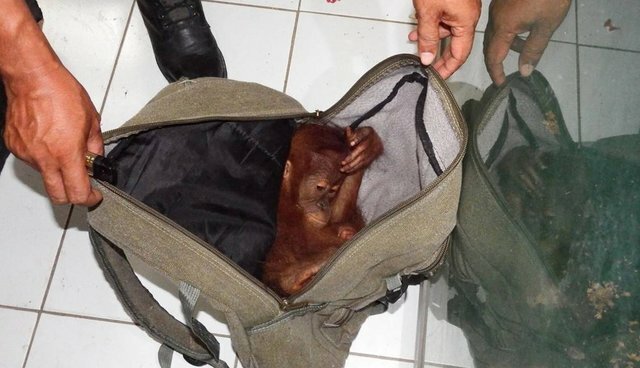 A harrowing photo released by the Wildlife Conservation Society (WCS) shows the Sumatran orangutan, a critically endangered species, curled up and cowering in the bottom of a backpack in the midst of what would have been a transaction. He would have been sold for $1,300 USD, according to the organization. Happily, the orangutan was taken to the Sumatran Orangutan Conservation Programme, a rehabilitation facility in North Sumatra, to recover. The young ape was the victim of a wildlife trafficker who had been selling exotic animals for the pet trade through Facebook and by BlackBerry Messenger. Identified only as VHN, the trader had been peddling a host of other animals, including golden cats, hedgehogs, greater slow loris, siamang, Javan gibbons, hornbills and juvenile crocodiles, according to the WCS. He was arrested earlier this week and identified as "a top player in the online trader network in Medan," the capital of North Sumatra. In Sumatra, orangutans are protected and it's illegal to own one as a pet. But despite the long list of species he's trafficked, VHN only faces up to five years in prison and a fine equivalent to $7,600. Conservationists hope that the arrest will at least serve as a warning. "The effort to stop orangutan and other wildlife trading is a tough journey with great commitment needed from all stakeholders," Irma Hermawatti of WCS's Wildlife Crimes Unit said in a statement. "We hope that the legal process can be effectively imposed in order to act as a deterrent to the perpetrator and anyone else who wants to perform similar acts."